TÜV Rheinland of North America is a Nationally Recognized Testing Laboratory (NRTL) in the United States and is accredited by the Standards Council of Canada to test and certify products to Canadian National Standards. Clients can demonstrate compliance for both U.S. and Canadian markets through a single mark (cTUVus) on their product(s) which denotes compliance to U.S. and Canadian National Standards. This symbol indicates that the product is approved by the Canadian Standards Association (CSA) as well as the Underwriters Laboratory (UL). 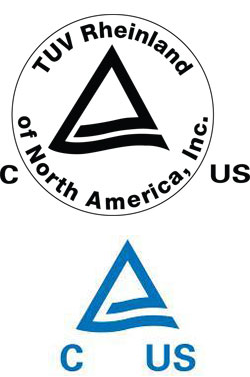 Both of the markings to the left are acceptable for the C TUV US marking. All of the NaceCare Solutions products with the cTUVus, C US or TUV Rheinland conform to all CSA standards and are recognised as CSA approved products. For any further questions regarding TUV and CSA on NaceCare Solutions products, please contact our technical department at (800) 387-3210. In Europe, a double insulated appliance must be labelled Class II, double insulated, or bear the double insulation symbol (a square inside another square). QPS is a nationally and internationally accredited independent third-party testing, certification and field evaluation body. They offer testing and certification services to US and Canadian standards and codes, as well as a variety of specialized services to European and International safety standards, such as CE marking, ATEX, CB Scheme Certificates, IECEx Scheme Certificates, etc. QPS is accredited by the Standards Council of Canada (SCC) as a Certification Body, a Testing Laboratory, and an Inspection Body. They are also recognized by all Provincial and Territorial Electrical Inspection Authorities across Canada. As such, there labels and marks have equal acceptance to those of CSA and UL by the Authority Having Jurisdiction (AHJ) across the country. In the USA QPS is accredited by: OSHA as a Nationally Recognized Testing Laboratory (NRTL), IAS (International Accreditation Service Inc.) as a Certification Body, and a Field Evaluation Body and A2LA (American Association of Laboratory Accreditation).